On Wednesday the 21st Callie's Picks issue was released and the theme was "Designer Galore". 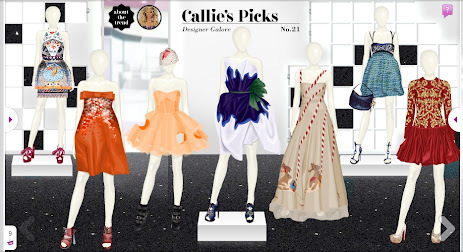 A collection of designer pieces from the archive of Stardoll. I love the whole aesthetic of the issue. The mannequins are not overloaded with clothes and accessories and the arrangement brings out a feeling of luxury. It's true that some of the dresses are highly priced, but that's what the whole issue is all about. Designer pieces are a luxury you have to pay a little more to acquire and that is something that applies both in real life and Stardoll! My favourite piece is the "Blouse Inspired by Stella McCartney". It's a stunning piece, one of the few in Stardoll that is as good as the real life version (if not better). It was an item I coveted for a long time and when I found it a few months ago (I bought two of them for some reason :P) I was super happy. I've been trying all these months to style it properly but still haven't found how. It's a statement piece and that makes it impossible for me to include in an outfit no matter how much I like it! I found an old post from PaperdollHeaven Lookbook, that featured --Kayley wearing it and looking absolutely fierce! Click here to read it. My other pick is the little "Black Gucci Handbag". It's cute, minimal and it can work with many different styles. Overall, nice presentation but not that great individual pieces. 3 dresses from there were free. the dior inspired 65sd dress was a gift from 111.111.111 members, you can easily find it in bazaar for a better price. in my humble opinion, callie gone crazy about prices. i just cant get it, stardoll is getting more and more and more expensive everyday. i hope this writing helps people who is going to buy stuff from callie :) you dont need to pay a lot of stardollars, just check them in baaar!